Courgettes (known as zucchini to Italians and Americans) are beautifully tender vegetables with a fresh, delicate flavour. Courgettes are usually marrows harvested at a young age, although the mature fruit of certain varieties of squash may also be sold as courgettes. For this recipe you will want to use the small, slightly bulbous, pale green variety often sold as Lebanese courgette, or Mexican grey zucchini in the US. Look for firm, heavy-feeling courgettes with unblemished bright and glossy skins. 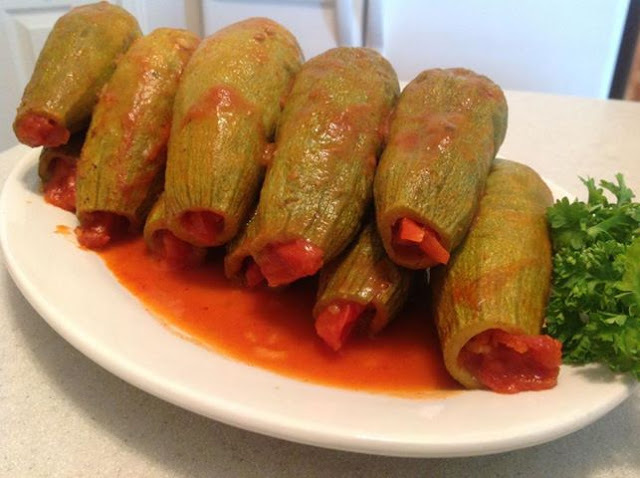 Kousa mahshi is a recipe in which the courgettes are stuffed with a mixture of minced meat and rice, and then cooked in flavourful tomato sauce. You can also use this recipe to make stuffed aubergine, bell pepper, and potato – to name a few. They all are delicious with the tomato sauce-soup. In the Middle East these vegetables are often prepared together. Another stuffed marrow dish of the Levant is called Sheikh al-Mahshi. In this recipe the courgettes are stuffed with meat and spices and then cooked in flavourful yoghurt. Hollow out the courgettes using a tool like a long apple corer designed for this purpose; you can find them in Middle Eastern food stores. To adapt this recipe for vegetarians, use chickpeas instead of minced beef. Enjoy Kouse Mahshi, and do share your cooking experience in the comment section below! 1. Wash zucchini and slice off the stem end. Use a long narrow apple or vegetable corer to core zucchini – leaving 1/2 inch walls, careful not to pierce the shell or the end. (Making a hole at the end of each zucchini with the corer, repeatedly digging in gently, twisting and pulling out the pulp. Do not core all the way through the opposite end. It’ll get easier with practice.) Set aside zucchini. Use the pulp for soup. 2. In a medium size bowl, add all the ingredients for the stuffing. Mix well with hands. Stuff the zucchini with the meat mixture leaving about 1 inch of the end open – so the mixture has room to expand. 3. Heat a large, deep covered skillet or pot on medium-high heat. Add onions and saute until they become translucent. Add minced garlic and saute about 1 minute, careful not to burn. Add the diced tomato with juices and tomato paste. Stir to incorporate tomato paste. Add salt and black pepper. Arrange stuffed zucchini in the pot so that all are on their sides (this allows cooking liquid to seep in). Add water to cover, so that zucchini are submerged (if not totally submerged – turn zucchini half way through cooking). Cover and bring to a boil, reduce heat to medium simmer. Cook for about 40 minutes until the zucchini are tender when pierced with a fork. 4. Gently remove and serve hot with the tomato broth and chunks atop. Garnish with fresh parsley or mint. And, also serve with plain yogurt and rice.